The ALERT121A Standard is an advanced ALERT or ALERT2TM transmitter that is designed to be a drop-in replacement for existing flood warning stations. Designed to be flexible, reliable, and low cost, the ALERT121A Standard uses the AL200 modulator and sensor interface, the industry-standard Maxon SD125E-series radio, and the powerful CR800-series datalogger. The ALERT121A Standard includes standard circular connectors for sensor and power inputs, as well as cable glands for additional inputs. 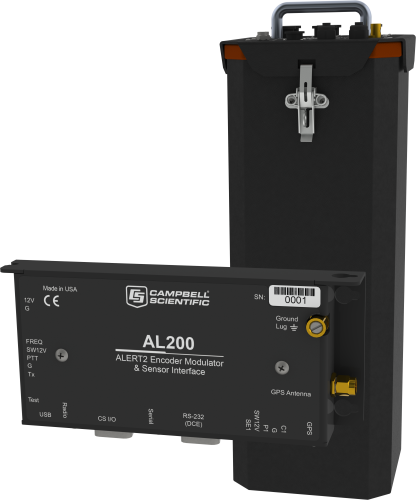 The modular design of the ALERT121A Standard transmitter allows for alternate configurations, additional peripherals, and easy replacement of individual components. Because the ALERT121A Standard is built around the CR800 datalogger, many additional communications options are available. Any ALERT121A-series transmitter can be converted between ALERT (legacy) and ALERT2TM protocol with a simple firmware change. The ALERT121A Standard system is ALERT (Legacy) and ALERT2TM compatible.